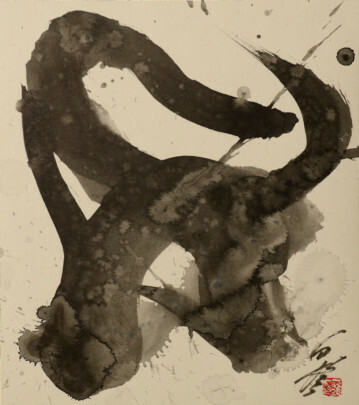 Born in Amagasaki, Hyogo Prefecture in 1924, died in 2008 at the age of 83.Shiraga enrolled in the Department of Japanese Painting at Kyoto City Art School in 1942. Influenced by Usaburo Toyama’s view of art classifying art into the two categories of “intelligent” and “emotional,” Shiraga decided to become a front runner in the “emotional” category. After graduation, he turned to Western- style painting and studied at the Osaka Municipal Institute of Art. In 1952, Shiraga formed the Zero- kai Group together with Akira Kanayama, Saburo Murakami, Atsuko Tanaka, among others. 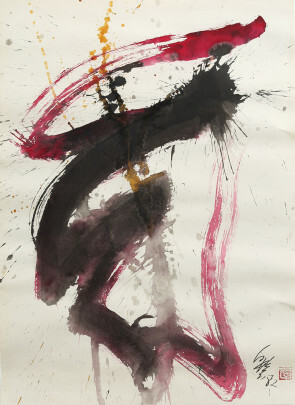 In 1954, he produced his first work painted with his feet and in the following year joined the Gutai Art Association with other Zero-kai members. Shiraga became a Buddhist priest at Enryakuji Temple on Mt. Hiei in 1971.